Montgomery County Police Officer Katie Beard has done a lot of good work during her 19 years on the force, but perhaps none as rewarding as working in the community. Beard finds creative ways to engage the community, meeting with senior citizens, collecting baby supplies for teenage mothers and visiting schools. 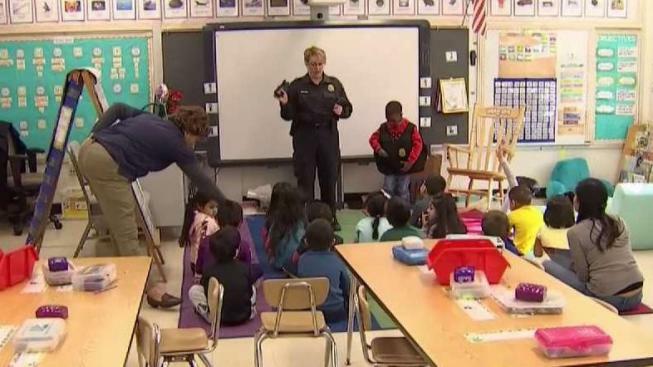 She wants the schoolchildren she visits to know they have a friend in the police department. “Especially later in life when the kids start to go through adolescence and they start to go through peer pressure, they know that they always had that person that was there for them," she said. Her dedication to the community is why Michelle James nominated her to be a Harris’ Hero. “Her whole day is filled with this, but she's really a blessing to Montgomery County,” James said. Beard goes above and beyond to make herself available. “She'll answer anybody's question anytime,” James said. "I go to swim practice just like you, have lacrosse with your kids, and I try to get that human element out there, too, and I think that helps a lot with building relationships," Beard said. "It’s important for me to be out there and be visible and so people know they can ask me questions and they can come up and they can talk to me," she said.